Zombie Outbreak is not currently available. Prepare yourself for a frightening, interactive, live-action zombie experience! Use state-of-the-art, replica weapons to demolish zombies in a military base. Watch out as live zombies wearing cutting-edge targets come at you from the most unlikely of places. Can you brave the zombie apocalypse and save the base? This interactive and immersive video game experience is unlike any other! 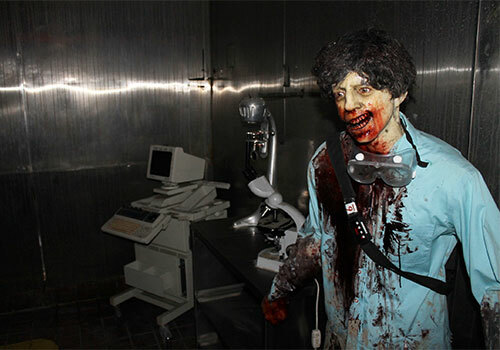 Zombie Outbreak is a live-action simulation experience. You and your team will be loaded up with cutting edge weapons and sent on a mission to clear the research facility of live free-roaming zombies! Will you survive the hoard? Work as a team and keep an eye on your six and you just might! Is this a scary attraction? The “scare” level all depends on how frightened you tend to be. Generally, the entire experience lasts anywhere from 10 to 15 minutes. Those who are “screamish” tend to rush through the experience to get out as fast as possible! Do note that the attraction is dark, fast-paced, and includes things/people that pop out at you. Participants will be hunting zombies in a simulated military confinement course. Throughout the experience, your job is to shoot the live-action zombies in the head. This is where the targets will be located to keep score. The course also contains hidden target boxes for you to shoot. If you hear a “beep” this means you missed a target or a zombie got too close to you, which also means you’ve been bitten! At the end of the game, you’ll see your calculated Kill/Bite ratio, which is your final score. 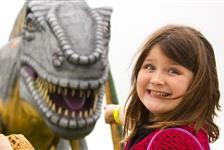 Is this attraction ideal for kids? It is recommended that only children ages 10 and up participate due to the frightening themes and elements used throughout the game. 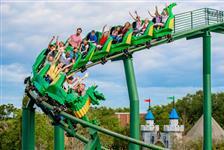 Children ages 12 and under must be accompanied by a parent at all times. No cardboard cut-out zombies are used during this game! 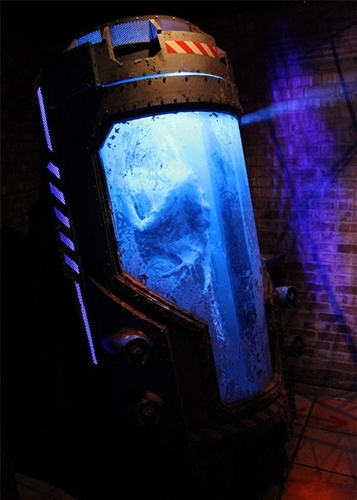 You’ll come face-to-face with walking/breathing zombies during your experience. How many people participate at a time? Groups of 4 or 5 participants enter at a time.